The Barnet Alliance for Public Services (BAPS) met on 4th of July, in what was effectively a relaunch for one of London’s longest running local anti-austerity organisations. The time could not be more right for the return of this grouping. Keen as ever to emphasise the strong ties between community organisations and the trade union movement, there were two invited speakers from the unions. Steve Hedley, assistant general secretary of RMT, drew strong comparisons between BAPS’ struggle over services with RMT’s battles in the transport sector. Not only is privatisation, to big businesses that asset strip and repeatedly fail, a common theme but so also is the axing of workers who are essential to vulnerable people. This is as true of station staff and train conductors as it is of librarians and local care workers – and our movement should fight to retain all these grades. Steve finished by contrasting the left and the labour movement’s genuine concern for protecting the innocent with the false narrative currently being peddled by the hard right who are making a false cause out of it, and he urged everyone to attend the anti-fascist demo on July 14th. 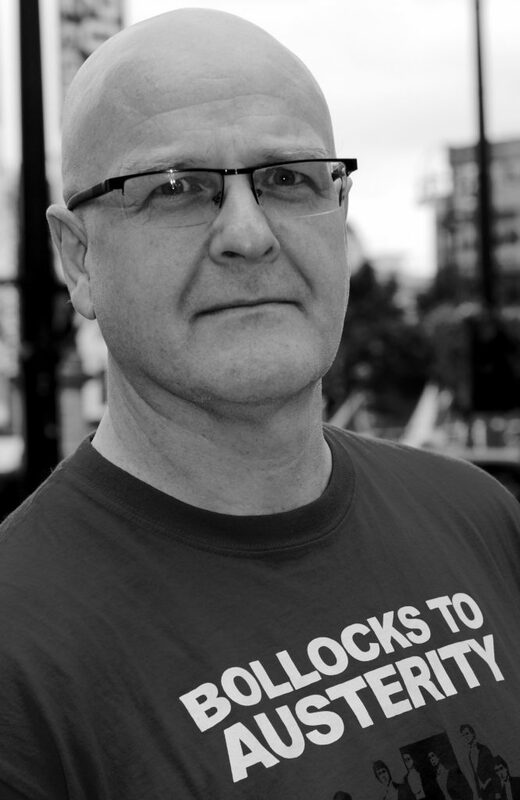 Steve Day then spoke from the Baker’s Union (BFAWU) about the ongoing ‘McStrike’, and it was great to get an update. Since a mere 47 workers launched their action, down the road from where we were meeting at McDonald’s HQ in Finchley, one of the biggest employers in the world has been forced to concede a 6.5% pay rise for almost 200 thousand workers in Britain. The campaign to organise and improve the conditions of McDonald’s workers continues, and Day concluded by saying there would be a lot more of our tax revenue to pay for public services if some much wasn’t currently having to be paid as in-work welfare to subsidise absurdly the absurdly low pay large companies pay to service staff. After the two guests, we had the more familiar faces of local “Mr Reasonable” blogger, John Dix, and Barnet Labour council group leader, Barry Rawlings. John reiterated that since the election, the news regarding the state of council finances just doesn’t stop getting worse. Cuts the Tories had initially estimated as totally £9 million are now looking more like £20 million (when John asked why the Tories were so caught off-gaurd by this, despite officers in Barnet being aware in February, he was told that Tory leader Richard Cornelius “doesn’t read reports”). The never-ending farce of payments to Capita (to say nothing of actual fraud) add completely unacceptably to this. Even when savings to their expensive provisions are found, Capita claim back 40% savings as “gain-share” – literal money for nothing! John said that on July 19th, when the Tories have been forced into having a council meeting to review options regarding Capita, good sense would call for so-called Option 3: bring it all back to the public sector. Barry, and numerous other Labour councillors from the borough, reiterated that the Tories are rampantly breaching election pledges, while doggedly supporting a national government that is directly responsible for lack of council funding, and called for pressure on Tory councillors and MPs to be maintained. The next steps in the campaign, then are to unite our forces for Option 3. There will be a cultural launch, featuring the start of the Barnet Wall, on Friday the 13th at West Hendon’s Midland Pub. The big push for campaigning will be to get people to protest at Hendon Town Hall on Wednesday the 19th at 6pm. 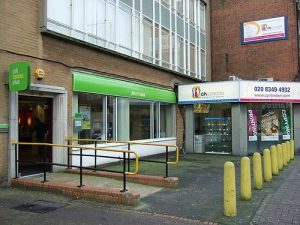 The Department of Work and Pensions newly announced cuts to Job Centres are hitting London, and Londoners, particularly hard. Here in Barnet, Edgware and Finchley jobcentres have both been confirmed for closure. Barnet Councils private contractors Capita have cancelled Freedom Passes for adults with mental health issues and other disabilities like autism without giving any notice. This has meant that many people have found out for the first time that their Pass has been cancelled while trying to use public transport. Others have had their Pass cancelled as a result of a reassessment, despite there being no change in their condition. 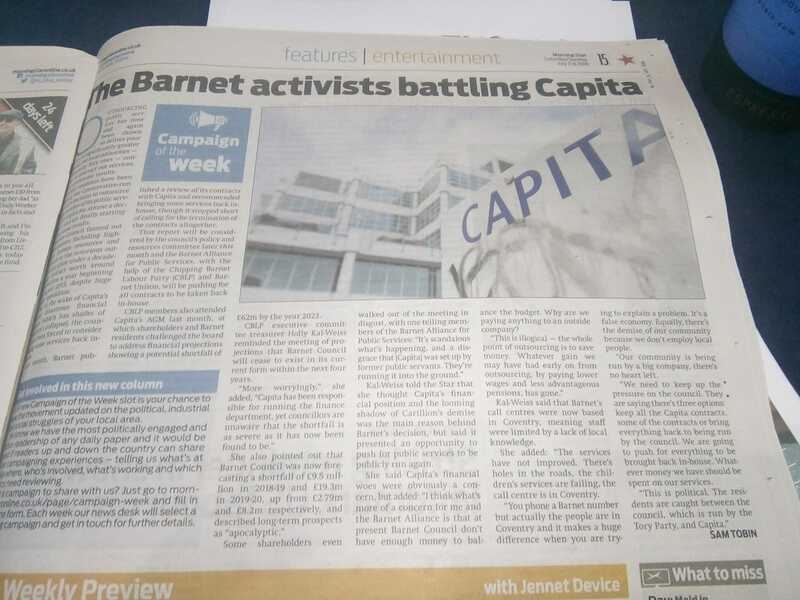 For further information on how Capita, on behalf of Barnet Council, are making the lives of disabled residents intolerable. Barnet Labour have started a petition for immediate reinstatement of the disabled Freedom pass to these residents. I urge you to please sign this petition and share throughout your networks. We must stand against this treatment of disabled residents. 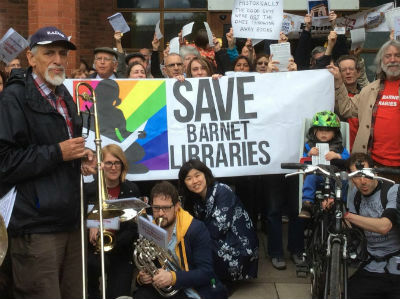 Barnet Council has used the examples of Denmark, Leeds and Peterborough to support their plan to replace Library workers with unstaffed libraries (Open+). Barnet UNISON exposed how the Danish use of unstaffed library opening differed from the Barnet plan. The UK precedents also do not support the Council. In Leeds, Farsley Library uses Open+ technology to enable unstaffed opening hours. Unlike Barnet no cuts were made to staffed hours. Farsley is in a quiet and leafy part of Leeds. Under 18s as well as adults with a record of anti-social behaviour in libraries could not in theory enter the building during unstaffed hours. Less than 10% of local users availed themselves of the unstaffed opening hours and there were problems with the technology which prevented access to the site. After running the experiment for over a year no decision has been made. This is hardly an endorsement of unstaffed libraries. This raises the following questions: When is an unstaffed library not an unstaffed library? And why not have kept existing staff on site who could have provided in depth and wider service? It is hoped that the Council’s continuing desire to press on with unstaffed opening is due to a lack of information rather than disregard for the safety of library users. Barnet UNISON calls on the Council to reconsider this plan and to engage in meaningful discussion on the issues with all stakeholders in our Library Service.